Work out with celebrity trainer Ashley Conrad and the Clutch Bodyshop team in real time! Clutch Life is a full, follow-along fitness plan that will deliver incredible results. Clutch Life is a totally unique fitness plan; I promise you've never seen anything quite like it. Every day, for the next 28 days, you'll get to work out with me and the Clutch Bodyshop team in real time. You'll get expert coaching, daily motivation, and clear exercise instruction, all without paying anything! Each day of the trainer includes a workout video. In these videos, my team and I go through the Clutch Life workouts with you—from the warm-up to the cool-down. 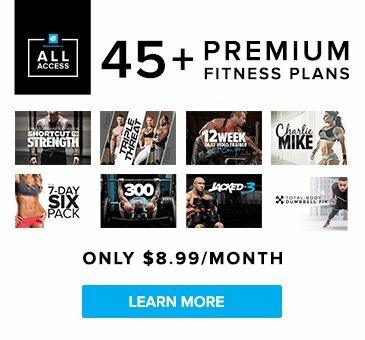 You can watch these daily workouts on your mobile device, laptop, or television, and get in an awesome workout anywhere, anytime! The Clutch life is all about balance. That's why these workouts are short, effective, and intense. You can do them anywhere, with minimal equipment, and then get right back to doing other things you enjoy. To top things off, the workouts in this plan will help you build muscle and burn fat, and there's a complete nutrition and supplement guide alongside the training plan. Before each workout, you'll go through a warm-up and stretching routine that will prepare your body for the work it's about to do. Then, you'll move into various types of circuits that are built to challenge every aspect of your fitness. The Clutch life is all about balance. That's why these workouts are short, effective, and intense. Early in the week, you'll train for strength; later in the week, you'll work conditioning hard by doing full-body workouts. Throughout the trainer, you'll work your core and increase your flexibility. Because these workouts are done circuit-style, you'll also consistently challenge your cardiovascular fitness, making this trainer great for all-over fitness improvement. Very few of these workouts will take more than an hour, and none of them require much equipment. So, whether you're doing them at home or in the gym, you'll be able to work hard and enjoy the rest of your day. This trainer is perfect for anyone who has a limited time budget but wants to get fit! The key to making these workouts effective is to work as hard as possible in the time you have available. Your intensity level should be at a 10 through every work circuit. Try to keep your rest periods as short as possible. Your heart rate should be elevated through the whole workout. If you don't go as hard as you can, you won't get the results you want. If you want to get fit and stay that way, you can't just go through the motions. The Clutch life is about doing exactly what's necessary to be your best. Each week, the number of rounds you perform for each circuit increases, so you'll be doing progressively more work as you go through the program. And, as you get fitter, you should be able to increase the number of reps you do of each exercise in the time allotted, so you'll continue to see great results. One of the things that sets the Clutch Life 24/7 Fitness Trainer apart from other trainers is its scalability. No matter your fitness level, you'll be able to do the workouts. If, for example, doing three rounds is too difficult on a given day, you can just do two. You can also increase the rest periods between circuits and use variations of the prescribed exercises to fit your level. We made this program scalable so you can use it for as long as you want. There's no reason to stop after one month! As long as you continue to challenge yourself and continue to see results, there's no reason to quit. When the circuits get too easy, add rounds, pounds, or reps, and decrease your rest periods. By doing so, you can adapt this trainer to suit your fitness level as it improves, so you can honestly follow it for 365 days a year.